Finding a unique viewpoint in Yosemite Valley to photograph is like finding the proverbial needle in a haystack. Nevertheless, that’s what I set out to do this evening in May. I had a vague idea for a shot which included two valley icons, Yosemite Falls and Half Dome, so I set out along the upper falls trail, unsure of what I would find. After about three miles of hiking, I turned to find an incredible vista of Half Dome and the roaring Falls. Unfortunately, the base of the upper falls was blocked from sight by vegetation. I solved that problem by (perhaps foolishly) climbing about 60 feet up the granite cliffs behind me and shimmying out onto a small ledge, which while slightly terrifying, gave me the clear view I needed to capture this image. 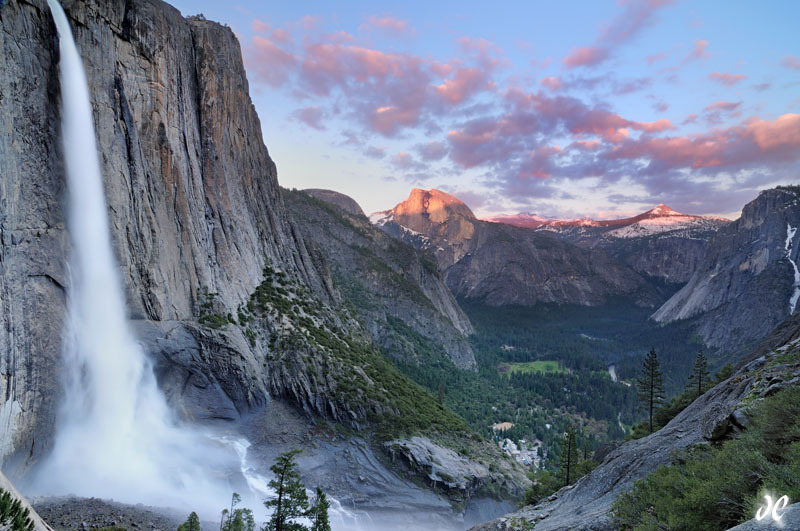 View more beautiful Yosemite photos.